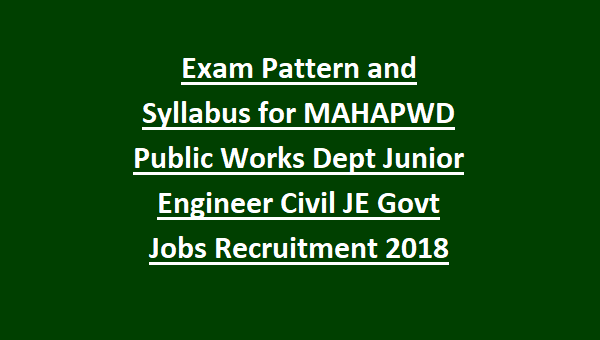 Exam Pattern and Syllabus for MAHAPWD Public Works Department Junior Engineer Civil JE Govt Jobs Recruitment Notification 2019, Exam Pattern and Syllabus for Water Resources Department Maharashtra Junior Civil Engineer Recruitment 2019 Apply Online-405 JE Jobs, Exam Pattern and Syllabus for Junior Engineer Civil Government Jobs in MAHAPWD Recruitment Notification, Maharashtra Recruitment 2019 Public Works Department Advertisement Apply Online for Civil Junior Engineer posts on Total 405 vacancies. a government jobs in PWD Maharashtra, they can apply online on or before 25-01-2019 for this JE Civil jobs. Written examination will be held on March/April-2019 under Maharashtra Mahapariksha organization. Out of 405 JE Posts, 122 posts are reserved for the female candidates. In this notification we are also providing the JE Exam Syllabus and pattern in detail. This is the best opportunity for the Civil Engineering Diploma qualified candidates to get a job in Maharashtra Public Works Dept. 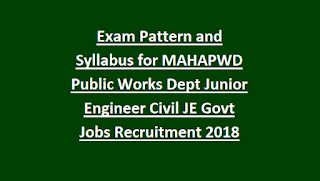 For complete details regarding Mahapariksha Maharashtra Public Works Department Junior Engineer Civil JE Recruitment 2019 exam pattern and Mahapariksha JE Exam syllabus, age limits, selection process, exam dates and other information is given below. Maharashtra Recruitment 2019 Public Works Department Advertisement Apply Online for Civil Junior Engineer posts on Total 405 vacancies. Out of 405 Civil Junior Engineer posts, 122 posts are reserved for the female candidates, 02 posts is reserved for Orphan and 13 posts are reserved for the sportspersons. Online application link available dates: From 05-01-2019 to 25-01-2019. Pay scale Rs.9300 to 34800 + GP Rs.4300 per month. The candidates must have qualified the 3 years Diploma in Civil Engineering or B.E or B.Tech Degree or its equivalent qualification from a recognized university or Board. Age limits for this MAHAPWD Junior Engineer Civil Recruitment is 18-38 years for general candidates. Upper age relaxations are applicable for SC/ST and other reserved candidates as per the Maharashtra Stage government norms. 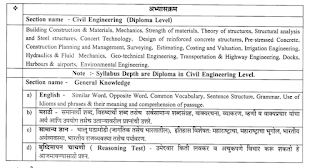 Selection for Civil Junior Engineer jobs of Maharashtra Public Works Department vacancies will be through written test and personal interview. For exam fee is Rs.450/- for general candidates and for others Rs.250/-. Online exam will be conducted for the 200 marks which consist of 100 questions. Paper 1 for 150 marks which having 75 questions. Online applications only accepted for this Maharashtra PWD Junior Engineer Civil jobs. 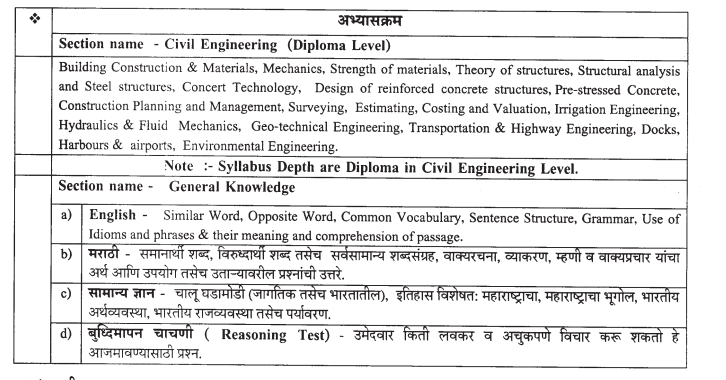 Candidates who qualified Civil engineering diploma they can apply online through www.mahapariksha.gov.in website on or before 25-01-2019. Exam Pattern and Syllabus in PDF format is also available in this website only. Click here to apply online for the Junior Engineer Civil in Maharashtra Public Works Department. Download Notification for MAHAPWD Public Works Department Civil Junior Engineer Jobs Recruitment Exam.